If you want to understand how Youth Journalism International operates, there are few things you should read. After that, check out the questions and answers below. Who is eligible to become a Youth Journalism International student? Anyone in the world who can write in English, remains a student and is not working professionally for a living. But generally it’s for those who are at least 12 years old and no older than 22 years old. We’re sorry that we can’t extend our help to older students. Students who are already a part of YJI may stay in the group until they are as old as 25 if the circumstances warrant it. How do I join Youth Journalism International? First off, we’re glad you’re interested! 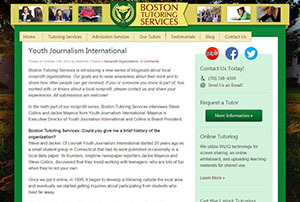 On Youth Journalism International’s home page – www.YouthJournalism.org – there is a link just below the masthead that says “JOIN.” You should click it, then fill out the form there as clearly and completely as you can. That’s the first, necessary step. However, the truth is that YJI has a long waiting list because our finances don’t begin to match the vast interest that students around the world have shown in participating. If you don’t hear from us, don’t despair. It doesn’t mean we don’t want you or that you didn’t qualify. You can begin to participate immediately by checking YJI’s Facebook page and joining in the conversation there. You can write comments on YJI stories. You can forward, respond and react to YJI on Twitter – @YJInow, @jackiemajerus, @yjinternational and @SteveCollinsYJI. We’ll notice you. That’s one way to jump the line. There are others, but we leave it to intrepid, enterprising young reporters to figure out methods to come to our attention if we’re not moving fast enough. How much does it cost to participate in Youth Journalism International? Youth Journalism International is free. For more than two decades, students have participated without having to pay anything at all. YJI strongly believes that finances should not hold back any student. Everyone deserves an opportunity to learn, regardless of how much money they have. With that said, though, the program cannot operate without contributions from generous supporters, including families of students who don’t have financial worries. Those with the means to help are strongly encouraged to do so. How can I donate to Youth Journalism International? But it is also possible to give online. Just click on the Donate button above. We are also able to accept direct bank transfers. Please send a note to editor@youthjournalism.org if you’re interested in doing so. Youth Journalism International is a 501(c)(3) public educational charity in the United States. Contributions are tax deductible in the USA. No. At this point, nobody connected with Youth Journalism International is paid anything. We are aiming to hire a part-time or full-time staff person as soon as we can, but students will never be paid for their work. This is an educational venture and we are convinced that offering free training and an internationally respected venue for your published work is more than enough compensation for anyone who belongs in YJI. Yes. We know that some school newspapers – and some parents – do not want young people to use their real or their full name online. We understand the motivation. But Youth Journalism International demands professional work of its students. Part of that is the use of complete bylines with your real name. It is a way of taking responsibility for your work and taking pride in it. Do I have to let my parents know I want to join? Where does Youth Journalism International get all these student writers? If you’ve seen the movie “Field of Dreams,” about a farmer in Iowa who builds a ballpark in his corn field with the idea that “if you build it, they will come,” then you already know. We just plug away, year after year, and a growing tidal wave of students find us online. We don’t really do much of anything to search them out. They find us. 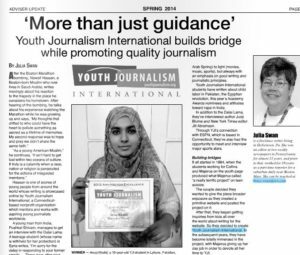 How does Youth Journalism International work with students in other countries and continents? A more complete answer will have to wait for another day, but if you read this story from the August 2011 issue of Hartford Magazine, you’ll have some idea how it all comes together. Who owns the work done by Youth Journalism International students? Youth Journalism International holds the copyright for the material it publishes. Any funds that may come its way from those seeking to reprint work will be used by the charity. Can I post a copy of my own articles on my blog, Facebook page or elsewhere? No. You can post links to your work, of course, but the work is copyrighted and we want people to see it on Youth Journalism International’s websites. That’s where you want them to see it as well. We have deadlines only for time-sensitive pieces. Generally, we like to get things as quickly as possible if they’re “new.” For instance, we’d want a review of a new movie as soon as we could get it. But, we’d also take a review of an old movie — you’d be surprised how many people like reading those! If you sent a review of a hot new movie and someone else sent one of a classic old one on the same day, both would get published, but we’d work on yours first. The other one could sit awhile. If you would go to see a play, we’d want the review right away, because that is when it would be of greatest value to readers, and to the theater, which would be doing us the courtesy of allowing reviews to attend. If we had an interesting event take place, we’d want something as soon as possible, not many days or weeks after the fact, when it is old news and rather stale. A lot of pieces are not time sensitive, however, and deal with an issue rather than a specific event. That might be something that you could work on for a long time. Some topics our students have covered in the past are teen suicide, teen pregnancy and depression. Travel writing is also something that isn’t necessarily time sensitive, either. I’m not sure this is all making a lot of sense, but essentially we deal with each article on an individual basis. We understand that you guys are busy and may not be able to drop everything for any given story. How do you decide what stories to write about? Youth Journalism International relies on its students to find stories they want to write about. There are times that we’ll suggest topics – the Olympics, a big election, a natural disaster, etc. – and see if anybody wants to tackle them. But we don’t ever require students to do anything. It’s all voluntary. In general, we’ve found that students know best what’s interesting in their hometowns and schools. They know what their classmates and friends will want to read. It is very much a reporter-driven system, though pieces are carefully edited before publication. That’s how students learn the craft. Where do YJI student stories appear? Right here on this website! At times, stories may also appear in partner publications and sites, newspapers and magazines. When that happens, we will at least link to them. Student pieces have also been republished in some textbooks. Why does it take so long to join? The reality is that we have a very small staff that can’t even begin to cope with the flood of applications that come in. If we don’t get back to you, it’s nothing personal. It’s no judgment of your abilities. It’s just that we never got to it. The problem we have is that we have spread ourselves very, very, very thin in order to deal with all the things YJI requires, from working with young people to posting stories online to administrative chores to fundraising. We probably should do more fundraising, since that’s the only way we’ll ever be able to keep up. We need a lot more money and a lot more staff to meet the demand. Our best advice to those who want to get in the door is to fill out the application form, give us a chance to respond and then show you have the gumption to be a good reporter. But don’t be a pest. There’s a fine line to walk, but it’s amazing how many can pull it off. Is there anything I could do to volunteer for YJI? Our most pressing need is to raise the funds to make it possible for YJI to grow. So what we need more than anything is help in rounding up contributions that make this organization financially sturdy and able to work with more young people in more places. If you can help us raise money, we could use you. Obviously, if you have specialized skills that could help us, we’re interested in hearing your ideas. Do you have scholarships or travel funds? No. We don’t have the funds we need to do even a fraction of what we would like to do. Do you have any internships or jobs available? Generally, no. We have no capacity at this point to oversee anyone’s work. If you have a specialized skill that you think we might be able to use, we’d be interested in hearing about it as long as you’re willing to donate your time. But until we have more money and staff, it is impossible for us to do more. More FAQs will be added here regularly. If you have a question, feel free to post it as a comment on this page. Last update on November 27, 2017.